How do I clean raw denim jeans? Avoid washing raw denim, or dark colors in general, in hot water. Hot water releases the dyes and other chemicals, such as sulfur dyes in the yarns, which could cause unpleasant smells. To keep dark jeans as dark as possible, hand wash and rinse them in cold water using a tub, sink, or anywhere where indigo dye won't permanently stain the surface. Turn the jeans inside out to best preserve dark colors. Jeans can be put in the spin cycle for draining before hand drying. Finally, allow the jeans to air dry over a surface or bucket that allows for the water and indigo dye to drip. For more on the subject, check our Frequently Asked Questions page entitled Should I presoak raw denim jeans? 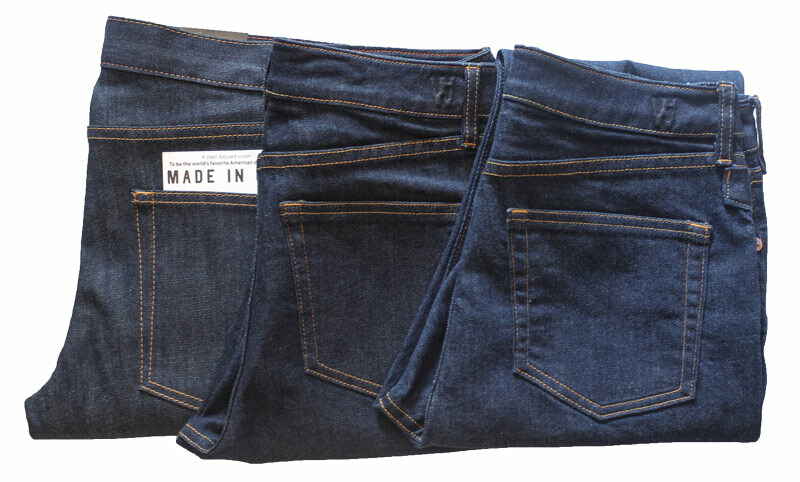 To show color change after one wash, the raw denim jean on the far left is unwashed. The center jean was soaked inside out in cold water. The jeans on the far right were machine washed in the delicate cycle in cold water. Machine washing jeans is suitable for jeans that are already faded, or for wearers that want to accelerate the aging of their jeans. However, machine washing jeans causes abrasion from the rubbing that goes on during machine washing. Air drying is best to minimize shrinkage. 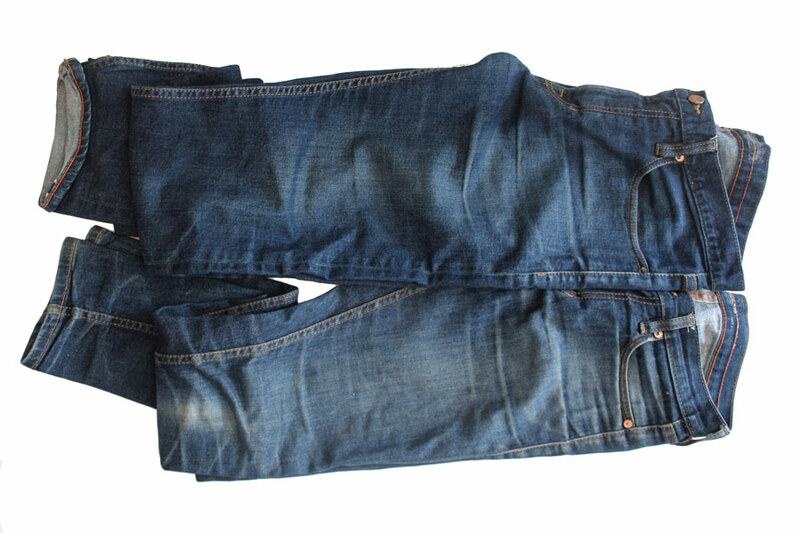 To speed up the drying process, put the jeans in a dryer until damp (nearly dry), then air dry the rest of the way. The above photo shows a faded jean that has gone through two machine washes at the top and faded jeans which have never been washed at the bottom. Note, the brown tint in the unwashed jeans which is caused by oils in the skin darkening the white yarns. The white yarns of the washed jeans are a little brighter because the wash has removed some oils. Hand washing is best for those who want to preserve the fade attributes on their jeans, as machine washing may add new abrasion details. The above photo supplied by customer Daniel Herndon wearing our stretch selvedge raw denim jeans. Age: 19 months. Care: 1 soak, 4 washes.